A little while back, I talked about the new, amazing product by the name of Olaplex. This product line is basically changing the game when it comes to protecting hair from the dangers chemical processing. Just to recap, the Olaplex system claims to have the ability to rebuild disulfide bonds in the hair. Disulfide bonds give our hair its elasticity and strength. The Olaplex technology vows to permanently rebuild these broken bonds. The innovation that create Olaplex is so unique that they've secured 8 patents. When hair product holds multiple patents, that let's me know that other formulations on the market aren't able to compare. For the sake of this review, I will share my experience using the system as a stand alone. Meaning, not in combination with a chemical process like bleaching or relaxing. This is golden liquid that is applied to unconditioned hair. Technically, you can apply to unwashed hair but if you think you've got some buildup, it's best to wash first, towel dry then apply. The instructions ask you to dilute in a few ounces of water. If the hair is extremely damaged, you can apply without diluting. My experience is that mixing it with 3 ounces of water was a bit excessive. I had at least an ounce left over and I didn't know if I could use the remainder during the next wash so I threw it away. The second time, I used much less water and found that I was able to fully saturate without creating much waste. Oh, I should mention that I applied using one of my super duper misters. Which made it so much easier to apply. It made the process highly efficient. Using an applicator like this one created way too much run off and dripping. Once the hair is fully saturated, I applied the Bond Perfector directly over the Bond Multiplier without washing. The Bond Perfector is cream with a similar consistency to a conditioner. Olaplex makes it clear that #2 is NOT a conditioner. It's used to "link the remaining dilsulfied bonds before and after service, restoring strength, structure and integrity to the hair." The directions say to leave in for at least 10 minutes, but I attended a conference call yesterday with representatives from Olaplex who advised that the longer it's left in, the better. The optional take home treatment also has the look and feel of a conditioner. 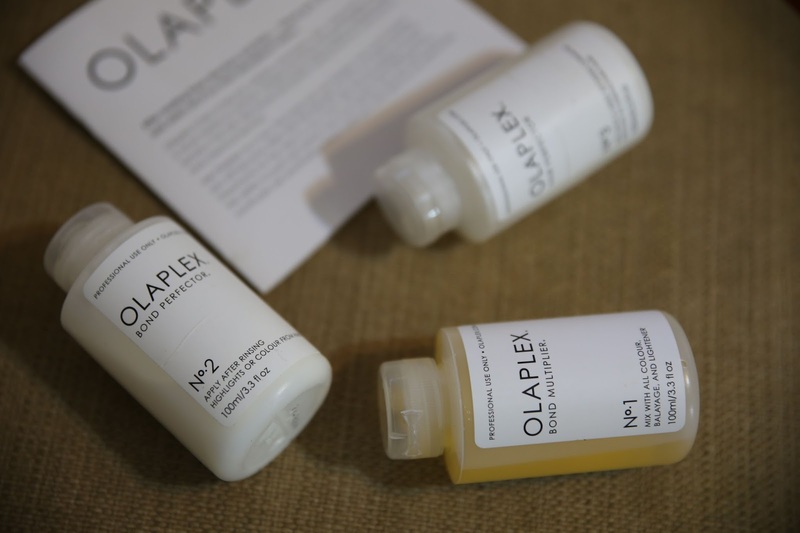 Olaplex states that #3 contains the same ingredients as #1 & #2. So just using #3 is highly beneficial to the hair. Again, this is not a conditioning treatment even though it looks and feels like it. I've been using #3 as a Pre-pre-poo. Meaning, I apply to dry hair, then layer conditioner over it. On one occasion, I was feeling especially lazy after application and feel asleep with the #3 and conditioner in my hair (under a plastic cap). Thank God there were no horrible consequences and my hair felt great. The folks on the call said that if you're lounging around the house, it's ok to leave it in for extended periods. One of the stylists on the call emphasized how important it is that the product is combed thoroughly combed through the hair so it doesn't sit on top of the hair. They made it clear that OLAPLEX IS NOT A CONDITIONER. It works on the internal structure of the hair, while most conditioners work to repair the external hair shaft. Because of this, it's important to put in as much effort as your normally would with your deep conditioning step. The first couple of times I used it, I didn't focus on deep conditioning so I could see how it works on it's own. Because Olaplex is not a protein, I didn't experience heavy stiffness or any issues even through I used the product back to back for several weeks. Olaplex works really well when paired with a hydrating conditioner. I even mixed Pure Protein in my deep conditioner, after applying Olaplex with absolutely no problem. The effectiveness of the treatment is correlated to the level of damage in the hair. So, if the hair is relatively healthy, you may no see a drastic transformation. Regarding using Olaxplex with a chemical service. I read online that a good practice would be to do an Olaplex treatment prior to a relaxer (maybe a few days before) to build the bonds. This will ensure there's strength in the hair to endure the treatment. Then, once the relaxer is rinsed out, you can use #1 & #2 to build back some of the broken bonds. The result is stronger, more resilient hair. I was tagged by an instabuddy who shared how happy she was with her Olaplex treatment post relaxer. My experience was somewhat mixed. Part of it was my fault. I tried (and failed) again to air dry so I couldn't tell if my hair felt healthier. But what I did notice was that it much stronger. My hair was much better equipped to handle manipulation without excessive breakage. Once I went back to roller setting, I noticed the difference. My hair just looked and felt healthier. I anticipated a cumulative effect as I used the product week after week and I got it. I barely lost any hair last wash. One thing I haven't done yet was to apply #1 &#2, then sit under steamer for a deeper effect. Though I plan to try it within the next day or two. I suspect this will create even more elasticity in the long run. Overall, I'm very pleased with the brand and it's results. If you have severely damaged hair, this product was practically made for you. If you're hair is healthy and strong, this is a "nice to have." If you're curious about the process, you can pick up #3 and try it at home. If you go to a stylist for touch ups, please school him/her on Olaplex so they have it available for your at your next touch up. Thanks for the review! I purchased a kit from eBay as well together with Sebastian clear cellophane and experimented with both for the first time. My hair came out soft and shiny and feels so strong. Plus no breakage when I combed so I'm in love! Have you heard of e-Cure Treatment and its other products? If cost is a factor, just go for #3! Olaplex recommends not using a spray bottle for applying number 1. Not sure why, but just a heads up.